Beautiful house right on the water. The house was very clean and accommodating, close by Grand Marais to drive in for dinner and town activities. Wonderful property with beautiful views of poplar lake. The cabin itself has plenty of space and is very well appointed. Very nice to be removed form cell and wifi coverage and detach in such a beautiful location. Cabin has a very nice feel, the moment we entered we felt very happy to be there. Called and left voice message regarding a leaking tub faucet in main floor bathroom and received call back within 1/2 hour. We really enjoyed our stay in log lodge 24. We were close to the mountain gondola ride - beautiful fall colors! - and the shore for sightseeing, restaurants, etc. 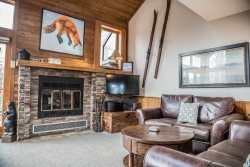 The lodge is well appointed and cozy for 2 couples. We liked the open concept great room and all the utensils and cookware in the kitchen. Having a gas grill to use for a steak dinner was a nice touch - didn't have to worry about buying charcoal, lighter fluid, etc. We loved the cottage, it was very clean and quite cozy. The only complaint is that the bedroom window opens to highway 61, which has traffic all night. The view of the lake is great, we could here the waves while enjoying a campfire. We had everything we needed right in the cottage, it was wonderful. This home is beautiful. The view is marvelous. I found a leak under the bathroom sink and had to call to request a repair person. They sent someone out within a few hours to get it fixed. Super friendly and very helpful! Absolutely loved staying at Minne Me! The cabin was lovely and set in such a nice, quiet setting. The bed was super comfortable! We had such a wonderful relaxing time I am already thinking about booking it for next year too! House was very nice, location was beautiful. Loved Keurig coffee! Everything was explained very thoroughly ahead of time regarding check-in, etc. Very timely and informative. We had no problem getting there and didn't have to contact no one when we were there. Thanks again for sharing your beautiful cabin with us! This property is beautiful! Loved that the place is so close to Lake Superior! Enjoyed fire every nite. Couldn't have asked for better weather too!! Didn't really work with anyone. This house was everything we hoped for and more! We loved the location, it was nice and quiet but yet only 10 minutes away from downtown Grand Marais. Our neighbors were so nice- it really added to the experience to get to know them! The house was so homey and we fell in love the second we walked through the door. The patio and backyard were an added bonus as well! See above note. Manager Tammy was amazing to work with! Our family had a wonderful stay at Baileys! We loved the open kitchen/dining/living area floor plan, and the view of the lake was wonderful. Amenities were perfect, providing everything we needed. Location was convenient and very quiet! Some were helpful . However one had little patience for explaining the process and fees. As we get older, understanding everything gets a little harder. We have stayed at Chateau Leveaux many times and love the location, the spectacular view and the property. The lobby is wonderful and the caretakers helpful. It's very clean and we liked the push button entries instead of keys. Very good online booking experience. The commnication was very specific, timely and thorough. The rental unit was very nice, exactly as pictured on the website. We found everything we needed. We found basic spices, coffee filters and a hair dryer were available, even though website said these items would not be available. Very helpful to have all the pertinent info posted on refrigerator. Helpful to have laminated note on TV operation placed near TV also. The location was perfect for hiking on the SHT. Easy access with the code on lockbox, no worry about losing keys. What I really liked about 6542 was the 3 sleeping areas as we 3 women all wanted our own bed. 3 toilets and 2 showers a big plus! Almost forgot--the bag of ice in freezer was appreciated- don't know if this is standard but should be. We had already brought our own. Liked the benches in kitchen area for setting our various bags on. We used cleaning tools available in closet. I believe we left the unit in a very clean state, the cleaners had an easy time after us! Suggestions: This unit needs: a cutting board, Hooks to hang up jackets & a rug near front door (appreciated the rubber mat for shoe placement). I think all units should come equipped with a hair dryer. We could have used more coffee cups. We had just enough towels but wonder if its an issue at times as I didn't see a backup supply handy. I wonder if folks should be aware that floors can be slippery when walking around in socks. There is some noise carry over from unit next door due to wood floors. As we age all the steps could be a drawback to this property but ok for now. Top notch, very knowledgeable, helpful, and friendly! Location and view were great. Adorable inside. The stairs to the upper lever were treacherously steep, though. The beds were comfy and had adequate amounts of blankets. Kitchen was equipped with a gas stove(BONUS!). Really liked the fact that they provided 7th Generation Cleaning Supplies(right up my alley!) Would have liked if there was a cutting board provided. If there was one, I couldn't find it. Loved the deck off the side of the house and the grill was great! Would have liked if there was regular TV, as well to see the local weather. The only thing provided was Roku, and you could view TV through apps, but the local weather was behind. The bathroom was cute and the towels provided were generously stocked. The house even had a washer and dryer! There was ample space and seating. A good sized dining room table was also a great feature. We had a wonderful time! We love Chateau Leveaux. Choosing it on the Internet randomly nine years ago has led to our making a much-anticipated visit every summer. Perfect get-away location with all imaginable amenities provided. Well thought out and cared for. A definite value for the cost. Great private location. We enjoyed our stay here. The cabin was well provisioned and comfortable. Loved the lake setting. Totally happy. Clean apartment, great view, and location perfect. Could travel north or south and see many views. It was easy to work with your team. The cabin is nicely located on the North Shore to the hiking available north and south. It is cozy with the basic needs met. Love the location. Close to the lake and very private. Everything was in working order except the screen door out to the deck is broken. The cabin is nicely equipped. If I were to be picky, I would like a chopping knife along with the other knives sharpened and better mattresses. We appreciated having a larger coffee maker (last year they only had a four cup maker). We loved our stay at Morning Light and plan to return. I was able to make all arrangements on line this time. On previous occasions when I needed to call the office they were extremely helpful and kind. Superior Reflections has to be one of the best locations on Lake Superior. The lake is just a few yards from the cabin and the road is far enough back so traffic noise is minimal. Very relaxing and very beautiful. The fact that we can bring our dog is how we originally found it. Now it is our place to go when we get a chance to flee the city for a few days. I have recommended it to several friends and family members. Your team is always helpful and easy to work with. We had a short but enjoyable stay - my husband was ill and weren't able to make the trip up until Wednesday (original check in day was Monday). The lake gave us its very best on the 3 days were there. Wednesday - calm and peaceful - sunny and warm. Thursday - choppy but blue - windy but warm. Friday - wind and high waves - being right up on rocks, the view from this cabin gave us an excellent show. We had never seen anything like it.